Published March 11th, 2010	in Shopping Promotion. 0 Comments	Tags: Coffee, Starbucks. Ask for a Coffee Journey Passport card to track your weekly bold coffee experience. Cards are available the first week, through 3/14/10. 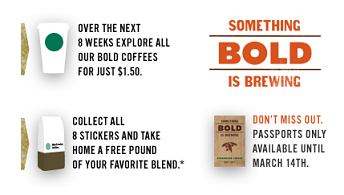 Sample a tall 12-oz bold coffee each week ($1.50) and get a sticker. Customers who collect 8 stickers (one per week) through May 3 will receive a free 1-lb. whole bean bold coffee of their choice. Go to starbucks.com/bold for more details.